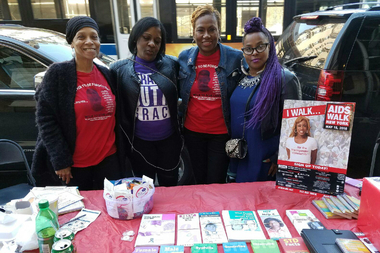 Maria Davis (second from right) at an HIV/AIDS awareness event May 10, 2016. CENTRAL PARK — For years, Maria Davis kept her AIDS diagnosis secret. Davis, a Harlem resident who carved out an important role in the New York hip-hop world as a promoter, cultivated the early start of Jay Z — and appeared on his debut album — and has also worked with other artists, such as P Diddy and 50 Cent. But, back in 1995, after applying for a life insurance policy, she discovered she was HIV positive and in 1998 when it transitioned to AIDS she was afraid to go public. But, after her health later improved she said she vowed to tell everyone. “That was my ‘God moment,’ when I made a pact with God that if you make my health better I got the biggest mouth in the world and I can be very influential in getting the word out,” she said. The walk, she said, is another way for her to inform the community and reduce the shame that still surrounds the disease. The event will also offer free and confidential HIV testing and additional health screenings. Roughly 100 walkers are registered to walk with Davis at this weekend's AIDS Walk NYC which is expected to bring 30,000 people to Central Park. “People are still walking around and don’t know they’re HIV positive because there’s still the stigma,” she said. Davis joined First Corinthian Baptist Church in 2006 and has grew into a role as its HIV prevention czar, with the blessing of the church’s Rev. Michael A. Walrond, Jr.
Embedded within the progressive church is Davis’ HIV ministry, which started in 2006 when she joined the church. The ministry, she said, is a movement and also an educational vehicle to remove the still prevalent stigma of HIV and AIDS in the African American community. About 44 percent of estimated new HIV diagnoses in the country were among African Americans, who comprise just 12 percent of the population, according to 2014 statistics from the CDC — the most recent available. “When I first came there they didn’t have an HIV ministry and he allowed me to develop HIV programs and he gave range to do what I wanted,” Davis said. Since then the church has grown exponentially from roughly 300 members a decade ago to well over 10,000 currently and has given Davis a unique platform. “I tell people I’m living with AIDS, but you don’t have to, you have to get educated and you have to have a conversation,” she said. The AIDS Walk begins at 9 a.m. Sunday, May 15 at Rumsey Platfield (Gold Area) in Central Park on East 72nd Street.